The No. 1-ranked Emory women's tennis team defeated No. 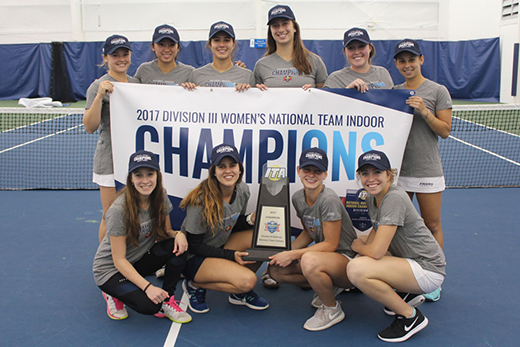 6-ranked Pomona-Pitzer College in the title match of the ITA National Indoor Championships on March 5. The title is the third for the Eagles in program history. The No. 1-ranked Emory women's tennis team defeated No. 6-ranked Pomona-Pitzer College in the title match of the ITA National Indoor Championships in Murfreesboro, Tennessee, on Sunday, March 5. The title is the third for the Eagles in program history and the first since the team won back-to-back championships in its last appearances in the tournament in 2010 and 2011. Emory's men's tennis team also won the ITA National Indoor Championship this year, earning the team's second consecutive title on Feb. 26. In the women's championship, Emory opened up a 2-0 advantage as it claimed the first two doubles matches on the afternoon. Senior Katarina Su and junior Bridget Harding began the scoring with an 8-3 decision on court one with seniors Michelle Satterfield and Michelle DeMeo following with an 8-4 victory at third doubles. The Sagehens salvaged the final doubles point as Caroline Casper and Arianna Chen knocked off senior Paula Castro and sophomore Daniela Lopez 8-4 at second doubles. The Eagles and Pomona-Pitzer traded barbs in the singles competition, splitting the six matches. Senior Melissa Goodman collected Emory's first singles win with a straight set 6-2, 6-3 verdict at fifth singles. Su added another victory for the Eagles at fourth singles with a come-from-behind 3-6, 6-2, 6-2 triumph over Chen. The match went down to the wire with the outcome being decided on court three. After falling in the first set, 7-5, to Mae Coyiuto, Lopez rallied by winning the next two sets in commanding fashion 6-3, 6-0 to clinch the ITA National Indoors team title for the Eagles. Emory now stands 4-1 on the season and will face UC-San Diego on Friday, March 10. Pomona-Pitzer falls to 6-1 on the season with the defeat.